A compact, bidirectional Dante/MADI format converter. 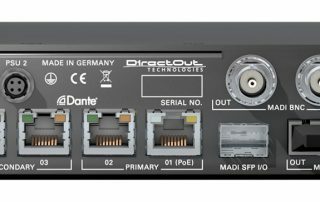 EXBOX.MD can simultaneously convert up to 64 channels of audio from Dante AoIP to MADI and 64 channels from MADI to Dante. AES67 is supported. DirectOut produces many other interfaces and accessories for use with multichannel digital audio. The compact EXBOX range includes EXBOX.64 for converting MADI streams between copper and optical formats; EXBOX.BLDS is a fail-safe MADI change-over switch for life-safety and other critical applications. For remote control applications, EXBOX.GPIO embeds/de-embeds GPIO control data into MADI streams; EXBOX.MIDICOM performs the same functions for MIDI and serial (RS-232/422/285) data. Audinate’s Dante AoIP protocol has proved an increasingly popular audio format for large-scale touring shows, OB vehicles as well as studio and broadcast infrastructure. 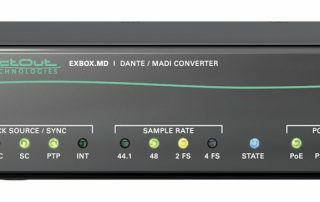 The EXBOX.MD simply converts up to 32 streams (i.e., 64 audio channels) between Dante and MADI formats, in both directions simultaneously. One-to-one channel matching, so that Channel n in a MADI input becomes Channel n in the Dante output or vice-versa is the default routing. The routing may be altered using the internal I/O matrix, which can be easily accessed via the web browser in a connected device. No setup is required other than selection of the appropriate clock source using standard Dante Controller software. Front panel LEDs indicate which input streams are active and locked, and also which is acting as the current clock master. All common sample rates are supported from 44.1 kHz to 192 kHz. Further LEDs confirm the rate in use. All common MADI formats are also supported: 48k, 96k and 192k frame rates, 56/57/64 channels, plus S/MUX. Three types of MADI port are fitted: i) a dual SC socket for multi/single-mode optical connection; ii) two BNC sockets (input and output); iii) an empty SFP cage for the user’s own choice of cartridge. The unit auto-switches to the first input type with a valid input stream, while all three outputs are always active. Network connection is via four RJ45 sockets – two primary and two secondary. An internal network switch permits additional Dante hardware to be connected. Thus, additional EXBOX.MD units may be cascaded to provide a greater channel count up to the maximum network capability of 512 channels. EXBOX.MD features DirectOut’s EARS (Enhanced Automatic Redundancy Switching) system, which gives the user the highest possible level of reliability in operation. EARS uses DirectOut’s proprietary BLDS trace tone, inserted synchronously onto Channel 32 of the Dante signals to or from a pair of multitrack recorders (depending whether the recorders are being used for recording or playback). In the event of failure of the primary Dante signal, EARS automatically switches between Channels 1-32 and 33-64 in an inter-sample gap , resulting in a completely seamless output. If all 64 channels of Dante are in use as a single stream, EXBOX.MD will switch between Dante and MADI sources. EARS is configured through a simple web page, where the engineer has full control over how the redundancy switching function should operate. If a BLDS tone is unavailable, EXBOX.MD will perform the same redundancy switch function using any audio tone >-40 dBFS as a pilot-tone; in this case, switching is achieved within 10 – 15 ms. The unit may be powered via PoE (Power-over-Ethernet) if wished. Alternatively two Hirose connectors allow connection of one or two external DC PSUs (one supplied). As with other units in the DirectOut EXBOX series, the unit is 1U high and one-third rackwidth wide. An optional mounting kit is available enabling EXBOX.MD to be mounted in a 19” rack, either alone or with one or two other EXBOX or MA2CHBOX.XL units.